We had a BLAST staying at Disney's Grand Californian Hotel and then visiting Disneyland and Disney's California Adventure. The last time we were there Michael still worked for the Mouse, Nathan was four, and Ben was two. 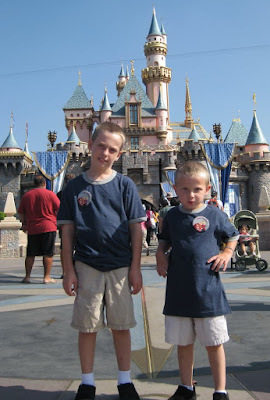 Knowing that the next time we visited the Park we would have to shell out hard earned cash to gain entry, we vowed to wait until Ben was tall enough to enjoy more than just the Fantasyland attractions and the Jungle Cruise. This time around Nathan is 54 inches tall and able to ride each and every Disney ride that has a height restriction. Benjamin is 44 inches and can ride all the rides except the ones that he shouldn't based on his heart condition and all. Let me just tell you right now that I do NOT miss having a baby! For all those moms who say but wouldn't you just love to have another little one (if you could)? I can say with all certainty, no thank you! This was an amazing trip because we got to experience everything with our kids, together as a family, and we didn't have to use the "child switch" option (crazy name, huh?) where one parent waits with the toddler while the other rides alone, and then they switch so the other parent can ride alone while the first one waits with the ever increasingly cranky toddler who is tired of hanging out in the Indiana Jones caverns and wants to get more of that Carousel action. So glad you all had a great time. The last time we went was 10 years ago and Brittany was just 7. She was tall enough to go on everything, and it was so much fun. I understand not wanting to have a baby there... I prefer to stay home and let Mark take the older ones to the amusement parks. My time will come again!